The first official ‘Australian Touring Car Championship’ was held at Gnoo Blas, Orange, New South Wales on 1 February 1960, the one race title was famously won by David McKay’s Jaguar Mk1 3.4. 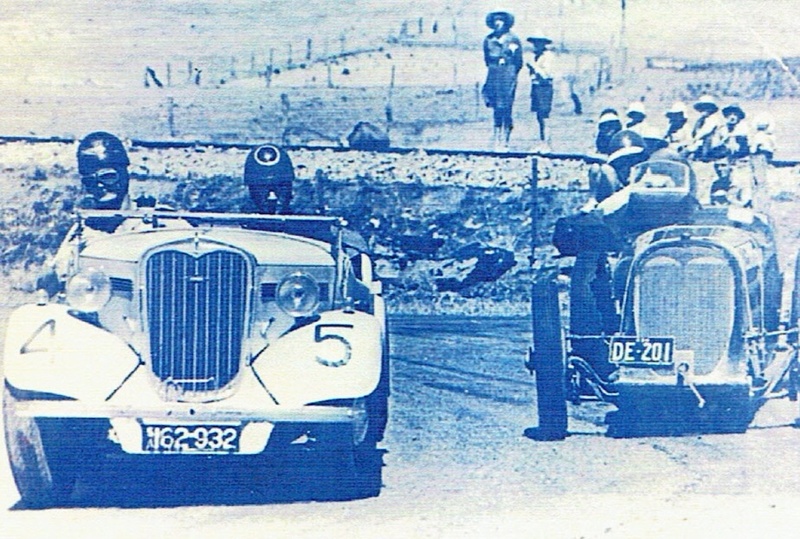 The racing of ‘run-what-you-brung’ production cars goes all the way back to the dawn of racing in Australia- to Intercontinental City to City record breaking, the ‘Car Trials’ run out of major towns and the speed events held within them, on dirt ‘speedways’ and ‘Around the Houses’ racing in Western Australia. 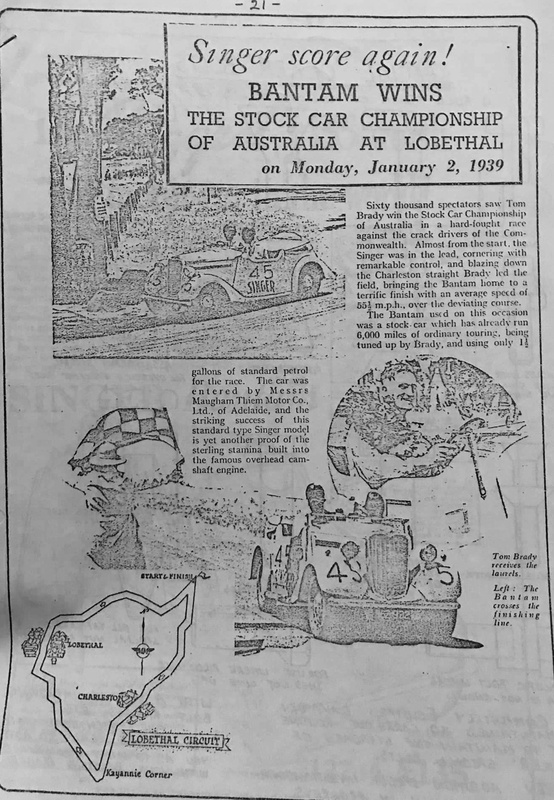 The Monday 2 January Lobethal 1939 AGP event program comprised a 10.45am ‘curtain-raiser’- the 75 mile South Australian Grand Prix, and then ‘an innovation, the Australian Stock Car Road Championship, in which all manner of stock car models, from sedans to tourers, and small engine roadsters have been entered’ over 50 miles held at 1pm. Finally the blue riband Australian Grand Prix contested over 150 miles of the ultra challenging, dangerous, demanding Lobethal road circuit commenced at 2.30pm. These races, consistent with Australian motor racing practice well into the sixties were run to handicaps- I’m not suggesting that all races into the sixties were handicaps, but some were. 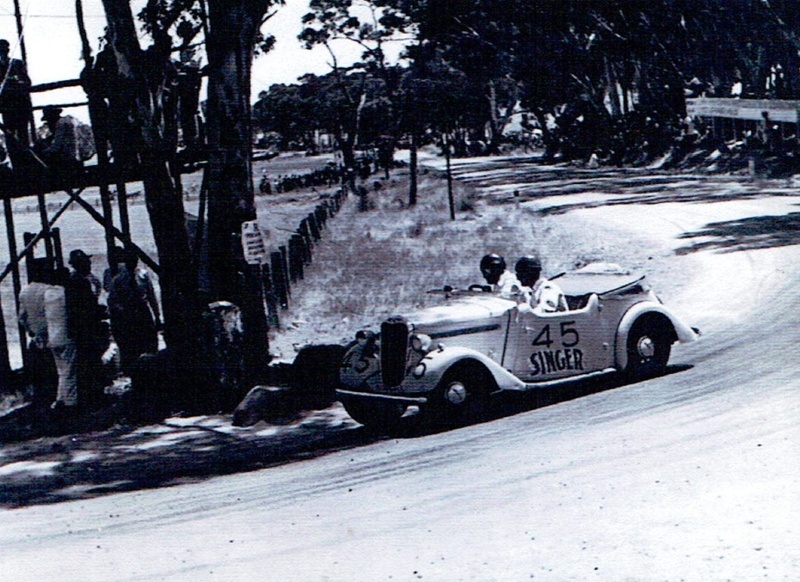 The last handicap AGP was the 1948 Point Cook, Melbourne race won by Frank Pratt’s BMW 328. The entry for the Lobethal stock car title race was diverse and comprised, as suggested above both ‘touring cars’ and ‘sports cars’. This too was the case in Australia until well into the fifties, ‘Sportscars were still seen as a natural part of a production car field, although the arrival of the Jaguar XK120 tended to stretch the friendship’…’The combination of sports and sedan cars to make up production car fields plus the frequent resort to handicapping, meant there were very few predictable winners amongst the touring cars of the early 1950s…’according to HATCC (The Official History of The Australian Touring Car Championship). 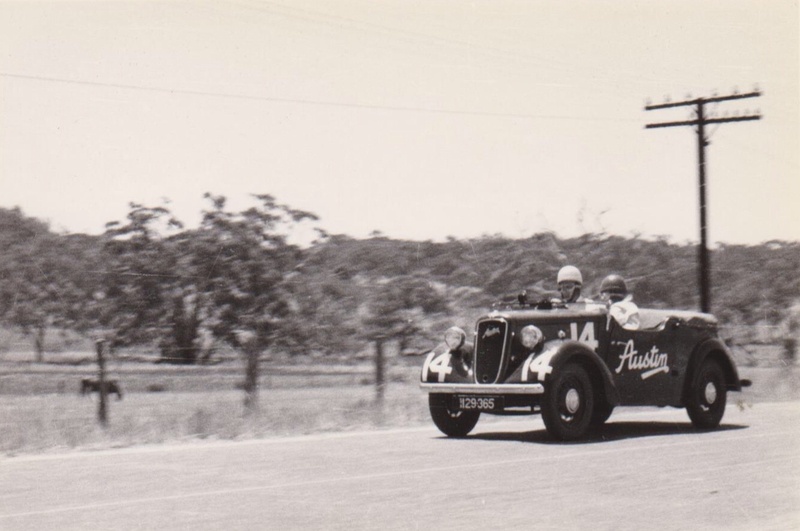 The ‘Geoghegans, Brocks and Lowndes’ of that 1939 day were Frank Kleinig in Bill McIntyre’s Hudson 8 and the similarly equipped John Snow, with Jock McKinnon, J McGowan and Ted Parsons in Ford V8’s. In amongst the ‘heavy metal’ were cars such as the Austin 8 raced by local ace of that marque Ron Uffindell, K Brooks’ Wolseley, D Hutton in a Morris 8/40 and Tom Bradey in a Singer 9 Bantam. The sportscars comprised MG T Types of Owen Dibbs and S Osborne, the MG ‘Tiger’ of Selwyn Haig and the fast Jaguar SS100 of G Brownsworth- he was off scratch as were Kleinig and Snow, the latter two blokes aces in the ‘Grand Prix’ machinery also racing that day. The winner of the AGP was Allan Tomlinson, the prodigiously quick and superbly prepared Perth ace aboard a supercharged MG TA, a wonderful story for another time. Soon actually, it’s completed. The Adelaide Advertiser’s reporter was not particularly impressed with the touring cars in practice. ‘The entrants in the Australian Stock Car Championship had trouble at almost all of the corners on the course, as the cars, not built for racing, swayed and threatened to overturn with the heavy loading imposed on the bodies imposed by the racing speeds’. Despite that, Kleinig lapped in 7:32 min/secs, Snow 7:35 and Phillips in 7:45- by way of comparison the lap record was held by Lobethal-Meister Alf Barrett in a 2.3 litre supercharged straight-eight Alfa Romeo Monza in 5:41- so in relative terms they were not too shabby. Perhaps modern comparisons are instructive. The F1 lap record at Albert Park is Schumacher’s 2004 Ferrari time of 1:24.125, the V8 Supercars record is Scott McLaughlin’s Ford FG X Falcon’s 1:54.6016. Kleinig’s time as a percentage of Barrett’s is 73%, McLaughlin’s of Schumacher’s is 80%- and so it should be, the V8 Supercar is a racer whilst the Hudson 8 was very much a production car. The point is that the relative production lap time of the Hudson relative to a Grand Prix car of the period is not too bad at all. ‘Chief interest in the Australian stock car championship centred on the possibility of J McKinnon Ford V8 (3 mins) catching the leader, TM Bradey who was off 11 minutes in the little four cylinder Singer. The speed of the race was very slow in comparison to the SA Grand Prix’ the Advertiser’s reporter ‘Differential’ observed. Bradey went into the lead from the Uffindell Austin 8 on the third time around with Hutton, Morris 8/40 a long way back in third. 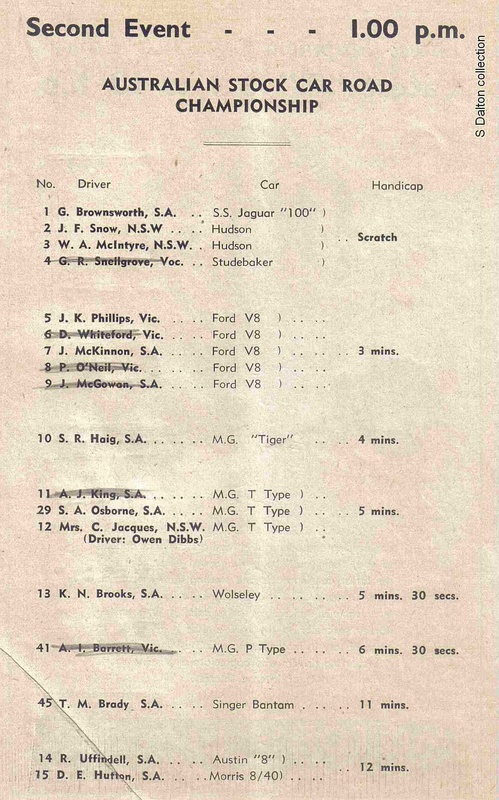 Brook’s Wolseley, Mrs Jacques MG T (Owen Gibbs driver) and the Osborne MG T retired at Kayannie after about three laps each, and McKinnon and Parsons in Ford V8’s moved up into fourth and fifth places respectively’. ‘Brownsworth with his low-slung racing type car (Jaguar SS100) was the best of the scratch men, and he left them to chase the other five. Lapping consistently at more than 70 miles an hour he moved up several places in successive laps and was gradually overhauling the leaders. Bradey, however maintained his lead to the finish’. 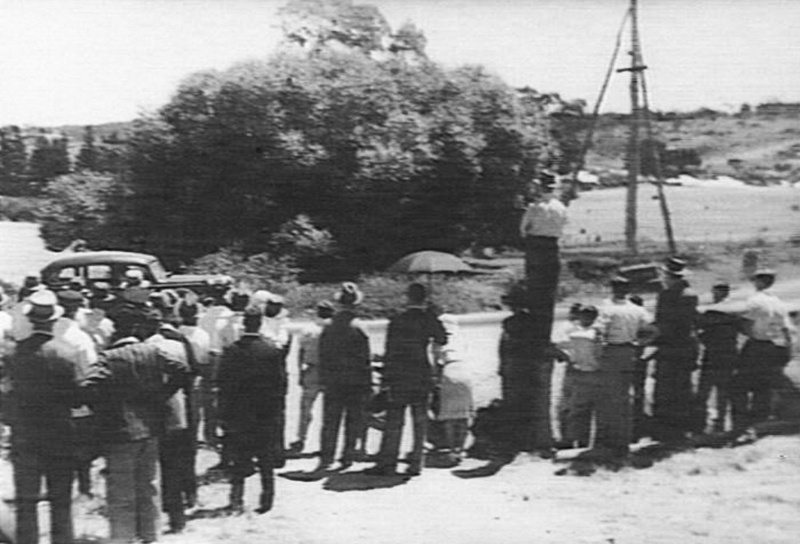 Tom Bradey was a motor mechanic from Barmera in South Australia’s Riverland, he and his mechanic, Charlie Sheppard, who owned the car, towed it the 200 Km to Lobethal. 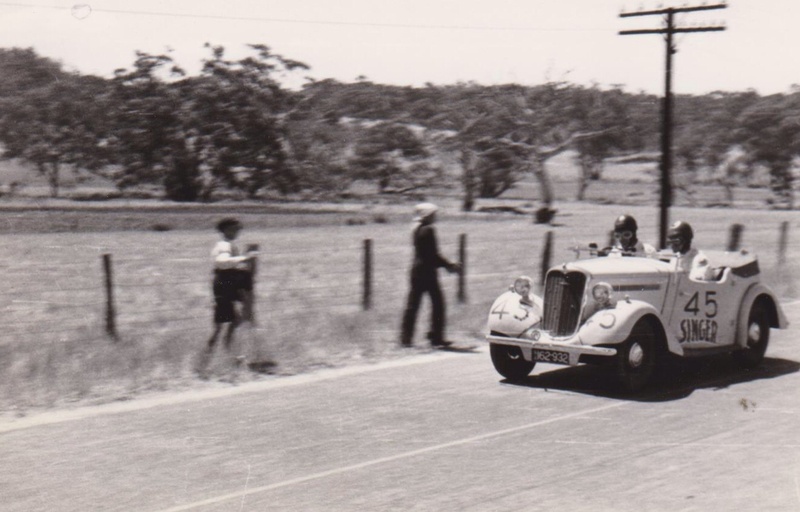 In a weekend of surprises for the Bradey family, James Redwood, Tom’s grandson wrote that ‘Uncles Peter and Don Bradey say he may not have told his wife (my grandmother) the whole truth about about his intention to race at Lobethal’. ‘Tom had set off with the family under the assumption that he was part of the support crew. The race was broadcast on the radio and it wasn’t until mention of Bradey on the call that the family realised he was the driver’. 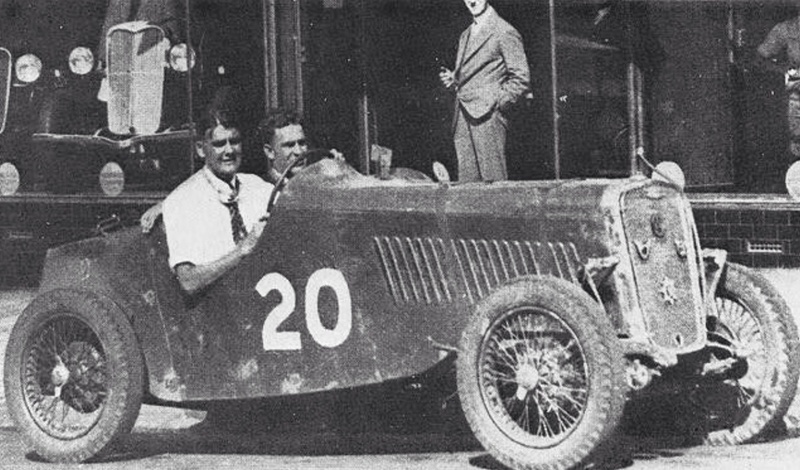 Bradey returned to Lobethal the following year and raced a Bugatti Brescia in the 1940 ‘South Australian 100′, but failed to finish the race won by Jack Phillips’ Ford V8 Spl. Years later, in 1958, he bought the ex-Bira/Colin Dunne MG K3 which won the Junior GP at Lobethal in Colin’s hands in 1938 and failed to start the ’39 AGP that weekend with engine troubles. Many Australian enthusiasts will recall the Bradeys ownership and use of the K3 for decades. 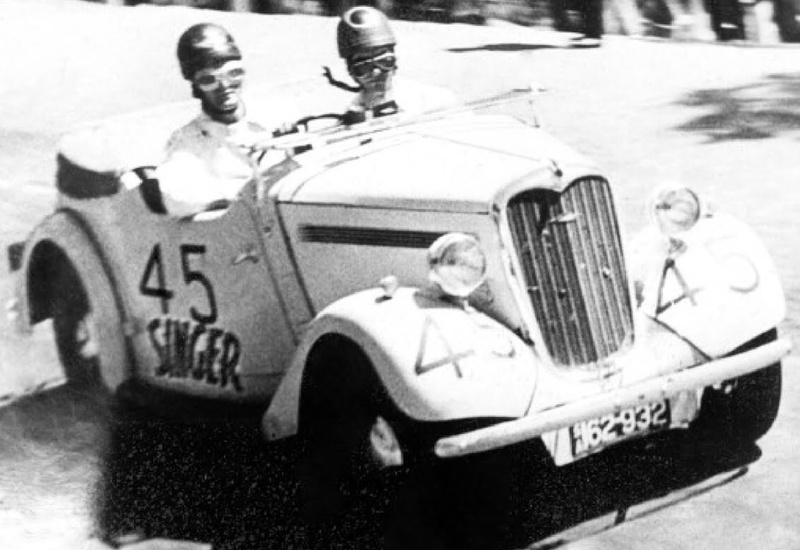 In a nice bit of symmetry, Tom Bradey was approached by a North Adelaide man with the offer of sale of a Singer 9 in similar specification to his winning 1939 title car, that car passed to James Redwood in 1972 and in restored condition is still used regularly- the Bradey family-Singer connection lives on. 1st TM Bradey Singer 9 Bantam in an actual race time of 54:08 minutes. 2nd J McKinnon Ford V8 . 3rd Ted Parsons Ford V8. 4th G Brownsworth Jaguar SS. 5th DE Hutton Morris 8/40. The placings below Hutton are unrecorded in both the Advertiser’s contemporary race report published on 3 January 1939 and in more modern reference sources. The fastest lap fell to Brownsworth- 7 min 27 sec at ‘just over 71 miles an hour’. Most results listings of the race have Jack Phillips as the driver of the third placed Ford V8. Whilst entered by him the car was raced by Ted Parsons according to The Advertiser. Jack and Ted were partners in a Ford service and sales agency at Wangaratta in northern Victoria. 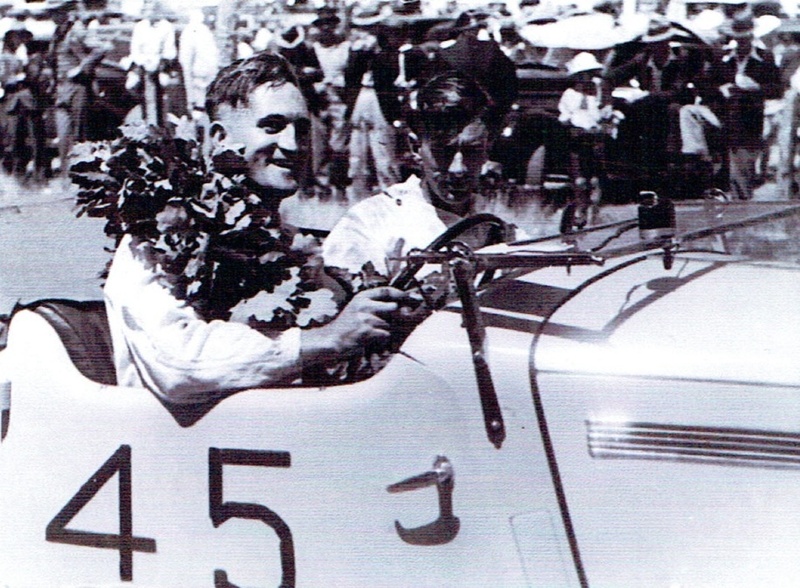 Phillips drove, and Parsons was riding mechanic in the Ford V8 Special the pair owned and raced so successfully in this period- inclusive of third place in the AGP held later in the day and wins at the Interstate Grand Prix at Wirlinga, Albury that March and in the 1940 South Australian 100 at Lobethal. It was 101 degrees Fahrenheit in the shade that scorching hot South Australian day- perhaps Phillips made a late call early in the sweltering weekend to preserve his energies for the AGP which immediately followed the stock car race, and allowed his partner to race in the support event. Phillips was one of the aces of the period, it does make you wonder what Jack could have done with the car had he been the driver- and also whether Parsons raced with Phillips’ handicap, which would have been tougher than that applied to him given his level of racing experience, or whether he was given a different handicap. I wonder if the Ford V8 raced by Parsons was off the Phillips/Parsons dealership floor in Wangaratta or supplied to them by FoMoCo?! Surely this isn’t the first factory racing Ford entered in an Australian Touring (Stock) Car Championship race?! Harry Firth where are you? 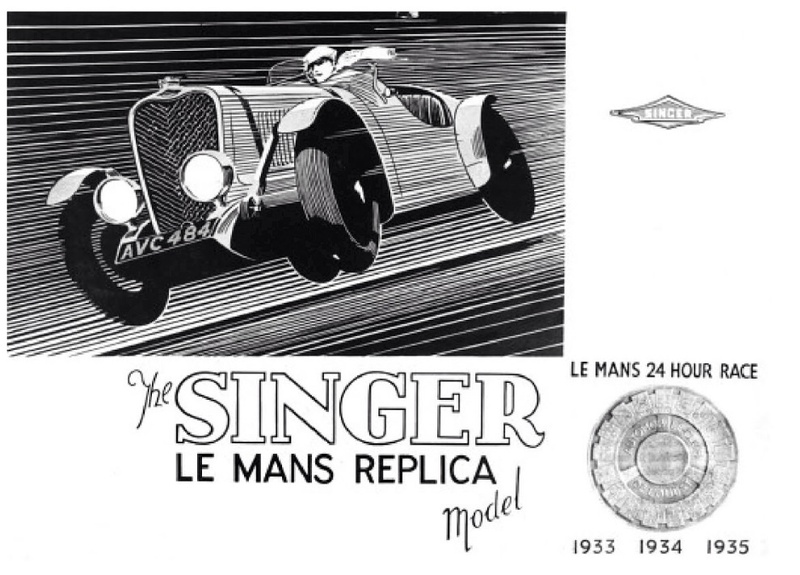 The ‘HATCC’ devotes several paragraphs to the race in its introduction but the emphasis of that part of the book is more about the rules of the time, ‘the race (the 1939 Lobe race) the programme explained was “open to standard touring or sportscars fitted with standard equipment and operating on standard first-grade fuel. The only alterations allowed will be raised compression ratio and alterations to the suspension in the interests of safety. In some cases, alterations to the suspension will be insisted upon”. Then the much respected authors of the book moved on to a discussion about racing after the war. Surely you missed the point blokes?! 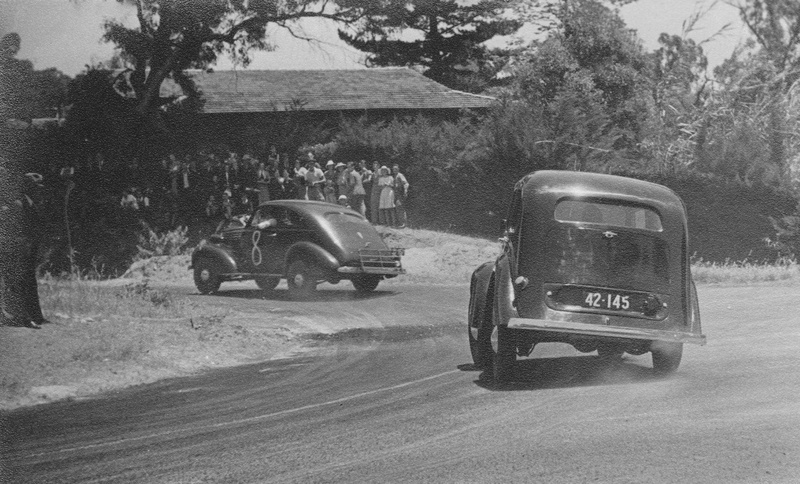 Which was or is a debate about the merits of Lobethal as the first Australian Touring Car Championship race rather than Gnoo Blas- which held the CAMS created ‘Australian Touring Car Championship’ title race under the then new ‘Appendix J’ rules which commenced on 1 January 1960. 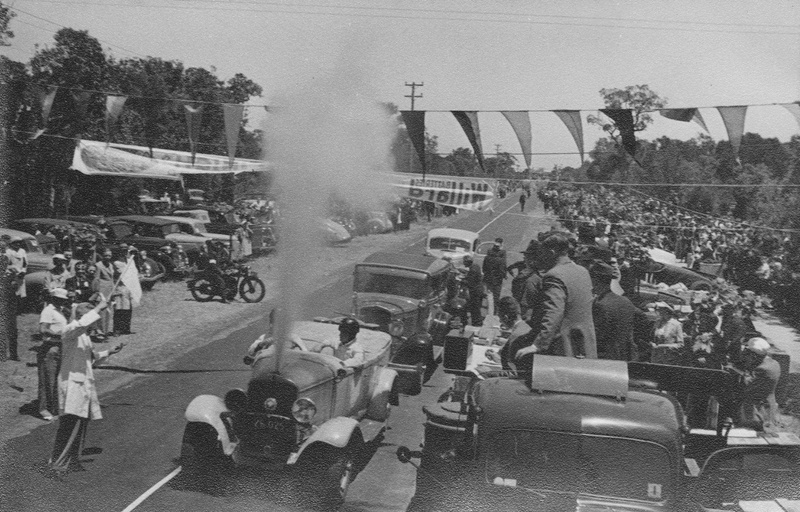 The honour of the first Australian Grand Prix was reallocated from the 31 March 1928 ‘100 Miles Road Race’, a race for cars of under 2 litres held on the original, rectangular, 6.5 mile gravel road course at Phillip Island, to the 15 January 1927 ‘Australian Grand Prix’, a six lap, 6 miles and a bit race between two cars around an oval, dirt, 1 mile 75 yards horse racing course at Goulburn, NSW’s second largest city. To be clear, the Phillip Island event was two races, the cars split into classes based on engine capacity, consisting of a total of seventeen starters from several states, with the quickest time winning- Captain Arthur Waite in an Austin 7 s/c was famously the victor. 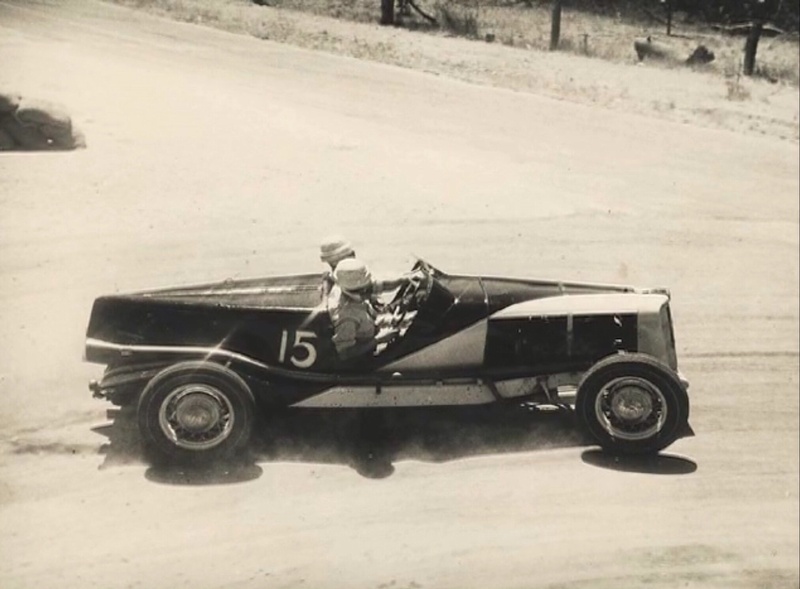 The Goulburn contest was amongst seven competitors from New South Wales- two heats and then a final amongst the quickest pair over 6 laps- the victor was local racer, Geoff Meredith in a Bugatti T30. My point is that if the attribution of ‘the first’ AGP can be reallocated on such debatable grounds- that the two-contestant Goulburn 6 minute 14.8 second race is an AGP in name only- then surely it is far from tenuous to assert that the first ATCC was the 2 January 1939 Lobethal race amongst competitors from two or three states won by Tom Bradey’s Singer 9 Bantam over 50 miles of the toughest ever race track in Australia, to rules or practices of the time which prevailed until the end of 1959? Don’t get me wrong, I agree- just, depending upon the number of Coopers ‘Reds’ consumed on the night, that the first AGP is the 1927 Goulburn race, but it is very easy to argue the other way given the entire nature of the event other than its name. John Blanden in his 1981 ‘A History of The Australian Grand Prix 1928-1939’ writes in his introductory comments about the Lobethal meeting that ‘Immediately preceding the Australian Grand Prix were two other events, the 75 mile South Australian Grand Prix and the Australian Stock Car Championship which in later years would have had the title of Australian Touring Car Championship’. Whilst on this jolly I rather suspect that had a Ford V8 won the Lobe race there would have been agitation from Ford/Ford fans/enthusiasts/historians to appropriate the 1939 championship as their first ATCC win but given the victor was a Singer- a long gone marque, there has been no such pressure applied. Then of course there is my conspiracy theory, there always has to be one of those surely!? The CAMS view of the world started with their existence in 1953, with all due respect to the serious historians spread across the CAMS Historic Commission, what happened in the past pre-1953 does not matter to the CAMS mainstream hierachy much. ‘The Official 50 Year History of The Australian Touring Car Championship’ published in 2011 to celebrate 50 years of the ATCC from the 1960 Gnoo Blas race has CAMS fingerprints all over it. I can’t help but wonder that even if the HATCC authors thought their was merit in recognising the 1939 Lobethal race as the first such title, and I’m not saying that is what they think/thought- I rather suspect the CAMS view is that the ATCC started with ‘their’ title in 1960- the ‘Official’ one, whereas the Lobethal race wasn’t an ‘Official’ championship but rather a concoction of the Sporting Car Club of South Australia, the organisers of the Lobethal meeting and is therefore ‘Unofficial’ rather than ‘Official’. 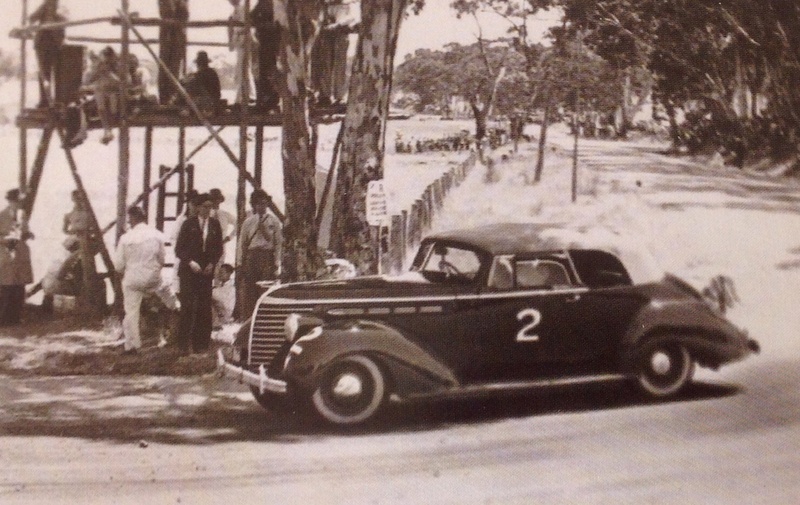 So, there you go, it’s all a CAMS conspiracy not to recognise Lobethal 1939 as it suits their dialogue and view of the world not to- even if the recognition of ’39 would make ’em the big swingin’ dicks of the touring car world by instantly giving them the oldest such title on the planet. But let’s move on from CAMS, it’s always best to move on from CAMS. Quickly and with plenty of distance. It’s just as easy to come up with reasons why the Lobethal meeting isn’t and wasn’t the first ATCC of course. Just like a good lawyer, I can argue the case either way depending upon who is paying me the most. And no, I am not a lawyer, I’m not cursed by the misplaced sense of superiority which afflicts those poor souls. So here are the arguments against Lobe ’39 first ATCC recognition, and rebuttals in relation thereto. 1.The race wasn’t called ‘The Australian Touring Car Championship’, if it wasn’t literally called just that, it doesn’t count as that. Well yep, ya got me sunshine. 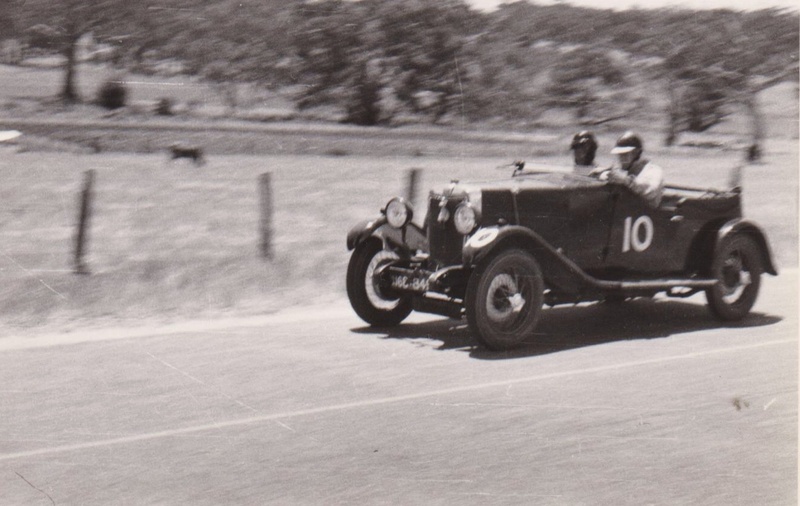 However, in Australia we happily call the 1928 ‘100 Miles Road Race’ at Phillip Island the 1928 AGP and the 26 December 1936 ‘South Australian Centenary Grand Prix’ the 1937 AGP (WTF, LOL, go figure etc) so calling the ‘Australian Stock Car Road Championship’ the ‘Australian Touring Car Championship’ is consistent with our flexibility in flicking around titles as and when it suits us. 2.A 50 mile race isn’t championship distance. Bugger off! The ’61 and ’63 ATCC’s at Lowood and Mallala were both 50 miles and they were tracks for ‘girl guides’ compared with the rigours and perils of Lobethal. 3.Thirteen starters isn’t championship numbers. Nah not really. Longford in ’62 only had only 14 cars and Sandown in ’65 only had 18- far fewer per head of population than Lobethal managed in ’39. 4. It wasn’t a touring car race with all those lid-less cars?! Well, sorta, maybe but not really. Since 1960 the ATCC has been held to numerous sets of rules- Appendix J, Group C, Group A, V8 Supercars etc. 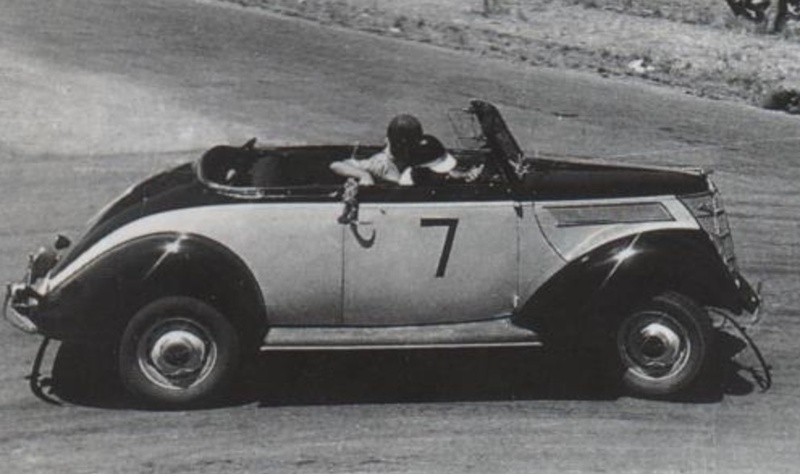 In 1939 touring cars included those with lids, what we now call a convertible and sportscars. ATCC rules have evolved over time, what happened in 1939 is consistent with changes along the journey made by CAMS. CAMS get confused every now and then too, about individual cars- for example, the Porsche 911, which most of us call a GT Coupe was ATCC eligible for a couple of years, then became a Sports Sedan and another two or so years later a Production Sportscar. Dimensionally during that period the car didn’t change but CAMS view of it did. Go figure. Don’t actually, because you will never figure it. 5.But Lobe was a handicap race, come on, surely not?! Yeah, well maybe. But what is the difference between the class structure used for 20 years or so to give everybody a fair go and handicaps? Don’t even talk about CAMS rule changes here and there in every other year as their tummies were tickled by the politically powerful to create ‘equalisation’ or ‘parity’ between cars. Good try but that argument doesn’t knock us out of the ring either. 6. You are just trying to knock off the ‘first’ ATCC from New South Wales and give it to those undeserving South Australians. I’m no more thieving a race from you mob than theft of the first AGP from the poor, smug, self righteous Victorians! My motives are as pure as any Canberra politicians. 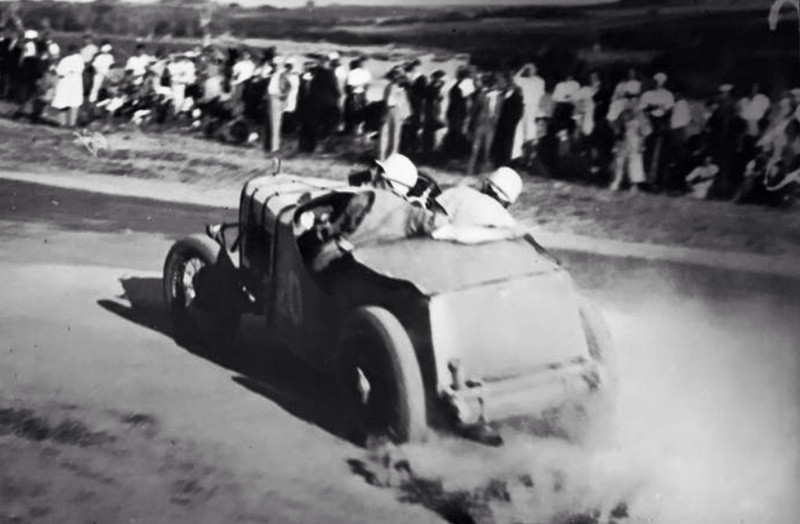 And so my friends, I put it to you that the one race, 50 mile 1939 Lobethal ‘Australian Stock Car Road Championship’ contested by thirteen or so cars and won by Tom Bradey’s Singer Bantam are indeed the first ATCC champion driver and car- official or otherwise. As many of you know I am not in the slightest bit interested in touring car racing of any sort so my impartiality in relation to all of this is absolute. 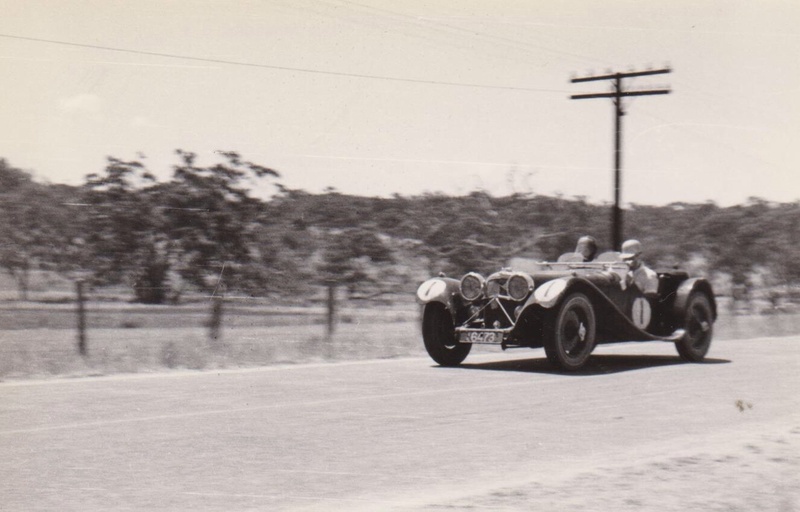 The marque is largely unknown in Australia today but had plenty of competition success in period, Bob Lea-Wright and Jack Kennedy won the 1934 Australian Grand Prix at Phillip Island in a Singer 9 Le Mans, as below. This car is currently being restored by Nathan Tasca and his father in Victoria and may break cover at Motorclassica shortly. 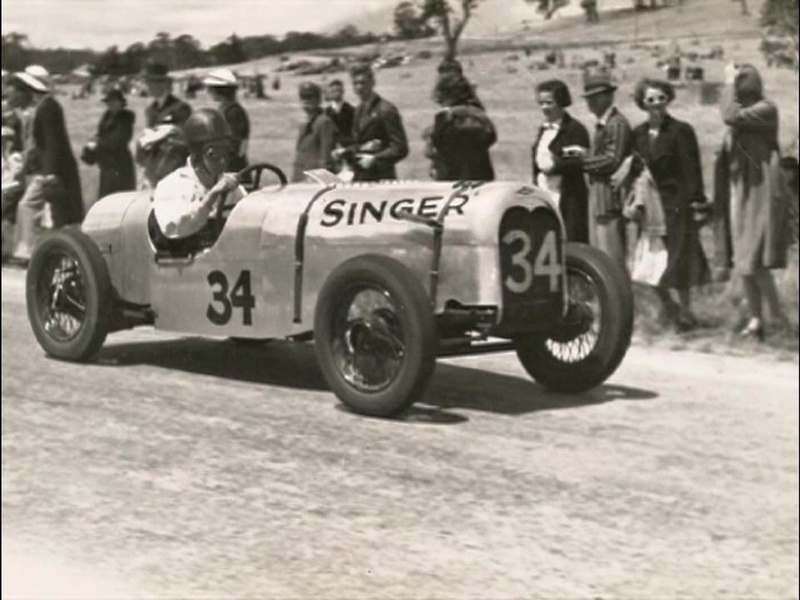 Sue Asinall, Bob Lea-Wright’s daughter recalls; ‘Dad and Jack Kennedy are outside the Singer dealership he managed in Melbourne after winning the ’34 AGP. It was an incredible achievement given during practice the engine blew up. Dad and Jack took the car back to Melbourne and worked all night to instal a new one. They wearily drove back to the ‘Island where they had to “run the engine in” over 8 hours around the track on the Sunday and then race on the Monday! My father also brought back other engine parts needed by fellow competitors! A true gentleman and genuine sportsman/competitor’. Lets not forget Noel Campbell’s win at Lobethal the year before, below. 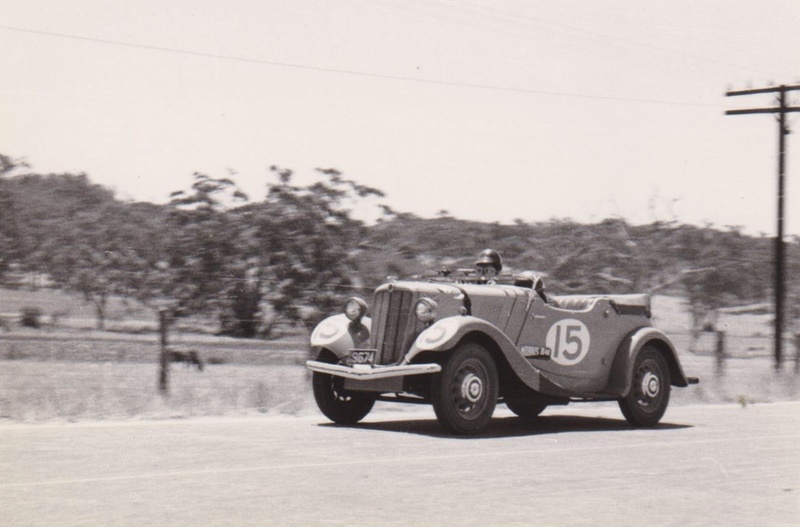 The Adelaide youngster won the 1938 South Australian Grand Prix at Lobethal in the circuit’s first car racing meeting that January driving his self built and modified Singer Bantam Special. Not too long after the win he moved to Sydney where the car provided daily transport after conversion back to more standard form, it too, most of it, is in Nathan Tasca’s hands. There is much, much more to the marque’s history in Australia but these two wins are just a couple of snippets to remember.